essential companion for anyone visiting Mexico or Guatemala. It is useful down through Nicaragua and even to Costa Rica. “A truly great field guide and a groundbreaking work that tackled many tricky and unstudied identification challenges for the first time. Sophie Webb’s illustrations are beautiful. The chief drawback of this guide is the heavy size; it’s not something a birder is going to carry around in the field. It also has a separation of plates and text, which makes for a lot of flipping pages. 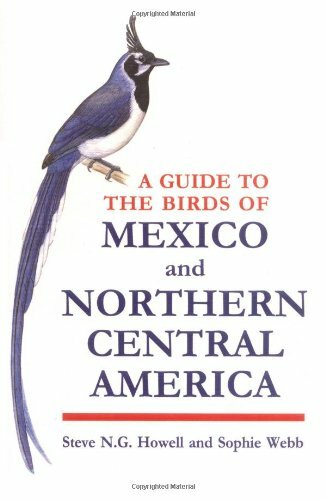 The pluses of this book are many, including the depth of coverage of many species, including basics of behavior, habitat, habits, plumage sequence, molt and geographic variation. This book is more of a home reference than a field guide; definitely not portable. I live in Mexico and use it often, but not in the field. (I know several people who have taken the book apart and had the plates bound separately for use in the field.) The plates are good, but do not include every bird (e.g., migrants) that you will see here, which is frustrating, especially for comparison purposes. The information is very good, but the maps are difficult to read as they are in black and white. I consider it an essential reference, but wish the publishers would consider a new, user-friendly edition that could be taken in the field.